UP: Name three people that you told after discovering you came in third place. SS: My husband, my son, and the people who saw it on my Facebook page! UP: What was your inspiration for the story? SS: The inspiration for Seed Savers came after watching the documentary, Food, Inc. I was struck by the story of Moe Parr, a seed cleaner who was being sued and hounded by Monsanto. The film mentioned how few seed cleaners operate today compared to some years ago, and I thought to myself, “Here is an occupation I have never heard of, and it’s about to become extinct.” The idea grew from there … into a time when people might not know about seeds. UP: Talk about growing up on a farm. SS: Well, it was hard work. My sisters and brother and I would get off the school bus, change our clothes, and go out and work in the field until it was time to come in for supper. We also worked on Saturdays and during spring and summer vacations. It wasn’t until I was in college and would come home to visit, that I really started appreciating the farm. Because of growing up on a farm, though, I’ve always had a very strict sense of eating seasonally and putting up food for winter. UP: How has being an English as a Second Language teacher helped with your writing? SS: The reason I wrote Seed Savers as a middle grade novel was for my students. I wanted a book that wasn’t so long as to be intimidating. My characters are the ages of the students I taught, and they are culturally diverse. It also helps me in writing dialogue of some of the characters whose English isn’t so great (this comes in more in the second and third books of the series), because I know the likely grammar mistakes they would make. UP: When speaking to students, what is the most important point you try to get across? SS: That if they want to write books well, they need to read. Many kids want to be authors, but don’t like to read. I was one of those kids, and I can tell you that reading widely will help your writing. UP: If possible, how would your book change the world? SS: By helping people discover the joy of good, fresh food. Maybe open some eyes as to the political situation of the world food supply, patenting and owning of seeds, harmful effects of GMOs. A lot of kids who read the books don’t realize that a significant portion of what is in the books is true and has already happened. UP: Is Seed Savers just for kids? SS: No, definitely not. Many adults have read and enjoyed Seed Savers. I think there’s a little something for everybody in the books. UP: What is your biggest fear with the future of gardening? UP: Where do you enjoying writing your stories? SS: I write my stories longhand in notebooks before I type them on the computer, so I can be almost anywhere and write. I particularly like to cozy up on the couch in the living room, around 2 pm, with light shining in from the sunroom. It’s essential that no one else is around to distract me. I really need a quiet place. SS: Always rewrite, rewrite, rewrite. Let the different drafts “rest” in between viewing. For publishing, it’s good to go through the process of trying to go traditional, because it will force you to make your writing the best. But then don’t waste too much time on it–self publish. UP: Where do you see your author career going in the future? SS: Next year I hope to do more school visits. I also want to publish some of my poetry and other novels I have started. I really like being an author and hope to soon be selling enough books to be financially sustainable. Thanks for the interview, those were great questions! 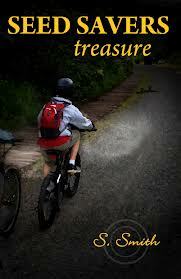 Seed Savers: Treasure is book 1 of the Seed Savers Series. Heirloom is book 3, and is scheduled for release in the fall of 2013.